Alternate universes, future landscapes, and “imaginary versions” have existed for almost as long as superhero comics themselves. It’s been a longstanding tradition to take a character we all know and love and change one or more aspects of them, sometimes to prove what works, sometimes to prove what doesn’t. Growing up a primarily Marvel fan, I was never all that interested in alternate universes or versions of characters. Most of my exposure to alternate versions was in the pages of What If...? (and the answer to that question was almost always, “they’d all die”). The Ultimate universe appeared to attempt this, but was mostly interested in providing updated versions of the same characters we already knew. Eventually they’d try to be more experimental, like killing Peter Parker and replacing him with Miles Morales. Usually, alternate versions are dreadfully boring or too derivative. Bland takes on the original hero, with one or two changes. The aforementioned Miles Morales is one of the few examples of a character that works on his own merits, and is entertaining in his own right. 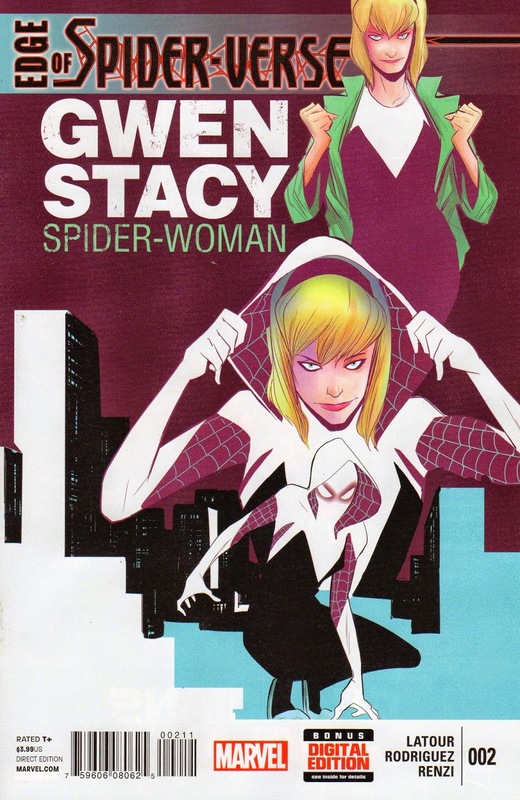 Jason Latour and Robbi Rodriguez, over the course of one twenty page comic, manage to create a fully-realized character in Gwen Stacy as Spider-Woman, and a world that you can’t help to want to read more of. Spider-Gwen isn’t merely Gwen as replacement for Peter Parker, with the same exact troubles and background, “only this time it’s a girl!” Nor is she just the Gwen we already know, only now with powers. Latour and Rodriguez have created a Gwen that feels true to the character we remember, but is also entirely her own character. 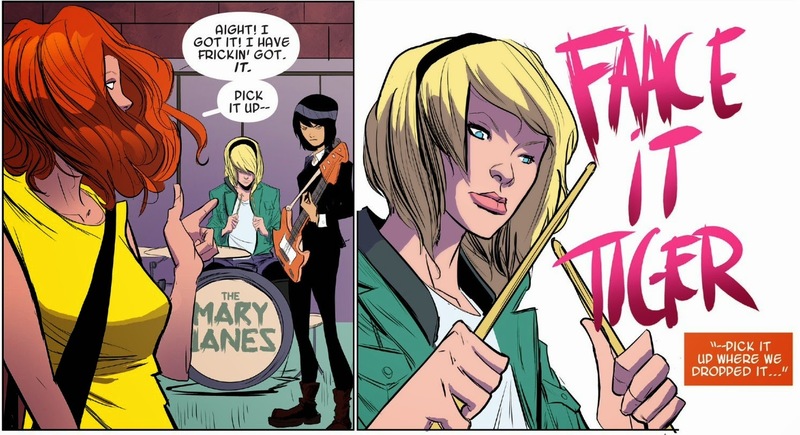 This new Gwen masks her pain and failure with humor, which is a very Spider-Man thing to do. The failure that motivates her is similar enough to invoke Uncle Ben, but different enough to not be a distraction. The world around her is intriguing and worthy of further exploration (what is up with slimy Matt Murdock?). Plus, who doesn't like an all-girl rock band? The art by Robbi Rodriguez does a good job of capturing the kinetic, creepy vibe of Ditko’s Spider-Man, yet still retaining its own style. The Spider-Woman costume design is striking and eye-catching, a very sleek interpretation that screams Spider-Man while also being its own thing. The white color scheme really makes it stand out, as beautifully rendered by color artist Rico Renzi. I’ve never been the biggest fan of alternate versions of characters. It's an incredibly difficult trick to create something that's familiar but can also stand on its own. Ben Reilly and Spider-Man 2099 (to stick with alternate Spider-Men) have been fairly interesting but not enough for me to find them essential to exist. 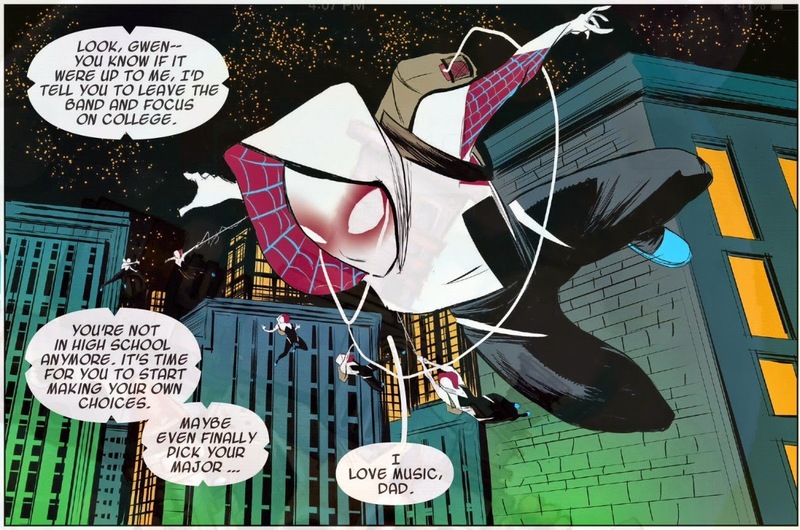 Yet, Spider-Gwen so thoroughly grabbed me in the space of one single issue, I can’t help but clamor for more. From the looks of things across the interwebs, I’m not the only one. 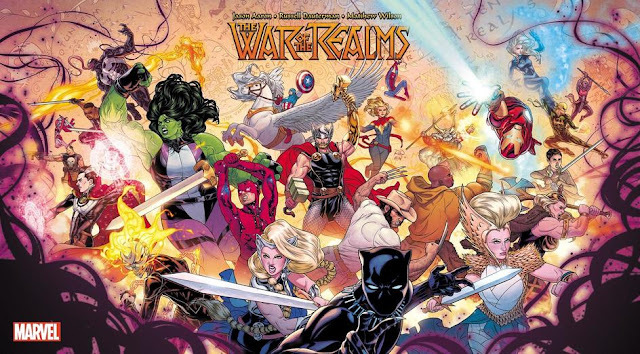 If Marvel doesn’t capitalize on that with an ongoing series, or at least a mini-series, it will be a mistake. A huge mistake. There was totally this 70s vibe in the story's mood. Like a New York that was a little darker, a little scarier when the sun set.